TV show dates: October 3, 2017 — March 6, 2018. Performers include: Jason Ritter, JoAnna Garcia Swisher, Kimberly Hébert Gregory, Chloe East, J. August Richards, Dustin Ybarra, and India de Beaufort. A fantasy comedy-drama from creators Michele Fazekas and Tara Butters, the Kevin (Probably) Saves the World TV show centers on Kevin Finn. While he is not the world’s worst person, Kevin is self-involved, self-centered, and materialistic. He is just starting to wake up to the fact that his obsessions with status and possessions have not brought him any happiness. At his lowest moment, Kevin is confronted with an incredible mission: it is up to him to save the world. While wallowing in his own misery, Kevin goes back home to Texas to stay with family. A widow, Amy (Swisher) is his twin sister, and the mother of a teenaged daughter, Reese (East). Their relationship has faded with time and distance, so Kevin doubts they can repair their connection. There, Kevin experiences a sequence of unbelievable events — not the least of which is a meteorite crashing near the family home. He then meets Yvette (Gregory), his heavenly guide. She informs him that 36 righteous souls are born into each generation. Their very existence protects the world, and he is the very last of his generation. Humanity is on the precipice of a catastrophe. Without the 36, everyone on Earth will begin to lose the only thing keeping them going — hope. Whether or not he wants to fulfill it, Kevin’s mission is to “power up” his soul. The only way to do so is by committing selfless acts of kindness. Should he stay on the straight and narrow, Kevin will eventually be able to locate and anoint the next generation of righteous souls. Yvette, meanwhile, will protect and guide him, train and instruct him, and most of all, brook no insolence from him. Kevin struggles with the idea that his relationship with Kristin might be in jeopardy while helping a stranger honor his deceased uncle’s burial wishes. Yvette makes a drastic decision regarding her future with Kevin by involving a celestial colleague named Cindy (Leslie Jones guest stars); and Amy receives an unexpected visit that changes everything. First aired: March 6, 2018. What do you think? Do you like the Kevin (Probably) Saves the World TV series? Should this TV show have been cancelled or renewed for a second season on ABC? Kevin (Probably) Saves the World: Cancelled or Renewed for Season Two on ABC? 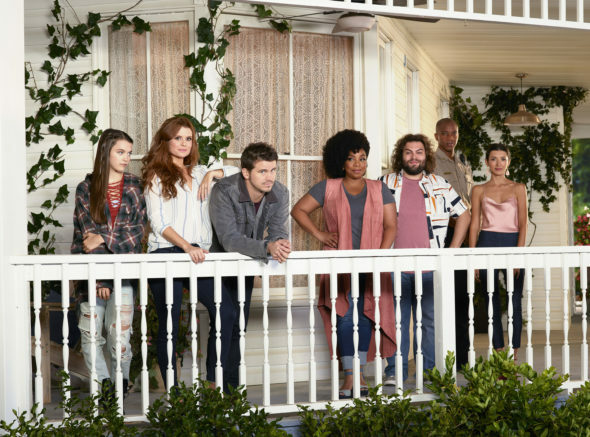 Kevin (Probably) Saves the World: Should the Low-Rated ABC Series Change Timeslots? We need shows like Kevin Probably saves the World! Bring it back! It is hilarious!!! And a good feel show! Bring it back, finally another show that was decent and not shoving a bunch of junk down your throat. Loved watching it!!! Please keep the show on! It’s fun and it is refreshing. There are too many dark shows on these days and You tend to get tired of those! The cast is great and their interactions with one another each week keep you in suspense! God friended me is such an uplifting show! It’s fine and it’s refreshing! Please do not get rid of that show! Please let it run for more seasons to come! This should’ve been given a 2nd season to shine or sold to another network. One of the few shows that was worth watching but like all the good ones, it was cancelled. Shameful! Great show, I was so looking forward to season 2!! Bring it back please!! It should be renewed. Such an awesome show! I really enjoyed this show!!!!!! overdone and old, and quite frankly sickening. Let’s bring some light into this world. Please renew rise for a second season. It was the only “today’ show to me that made sense. Why is it that only decent shows get canceled while crappy TV lives on !?!?!???? BRING BACK RISE!! People are petitioning to bring it back. Should be coming back for another season. Funny, entertaining and everyone can watch. like Kevin. Sorry it didn’t make the cut! !